Add diced eggs to a medium bow. Add mayonnaise, mustard, pickles, pickle brine, and a pinch of salt and pepper. Stir to combine well. Taste and add additional salt, pepper, or pickle brine as desired. For Curry Egg Salad – 2 eggs, 1 1/2 Tbsp mayo, 1 tsp mustard (optional), 1 tsp lemon juice and a pinch (about 1/8 tsp) yellow curry powder. Salt and pepper, to taste. For BLT Egg Salad – Make as directed above. 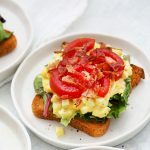 Serve on a piece of toast with lettuce, egg salad, and a garnish of cooked, crumbled bacon and diced or sliced tomatoes.